At the end of Race 4, there was a unanimous decision amongst the fleet that the Regatta Committee ordered and received flawless weather. Wind speed started today at 16 knots climbing steadily to the low 20s, turning the last day of racing into a grand finale. Nearly 50 yachts, with sun, clear skies and the Caribbean’s sassy seas turned the waters off Antigua into an artistic masterpiece. For those following the race through the lens of a camera, it was a dream come true. On the Windward course, flying sails popped out for the broad reach after the first mark. 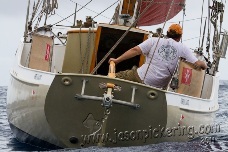 The three-masted schooner Spirit of Bermuda’s spinnaker was the most notable, emblazoned with a dark and stormy seal, until it self destructed and took a swim. There were some dramatic close calls today - nicely executed, of course! Rounding the mark at Old Road Bluff saw a few traffic jams as boats hardened up for the beat while manoeuvering between the beach and tight tacking duels. It was definitely not the place for indecision. Yachts came to Antigua with purpose. Rittler Sighe, owner of Tilly XV, gave up a quest to scale the 7 summits of the world, replacing it with sailing his Sonderklasse Gaff Sloop at all 7 Panerai Classic Regattas. Class Lehmann and Sophie Heyer on Hera, their Abeking and Rasmussan yawl, sailed across the Atlantic in December with their 6-week-old daughter to take part. Judging by the party near their boat each afternoon, it was well worth the effort. Four boats finished today holding all firsts: the 42’ German Frers Vagabundo II; Adix, a 178’ Holgate 3 Masted Gaff Schooner; Chloe Giselle, a Sean McMillan 65 Spirit Sloop; and Chronos the 157’ Klaus Roder Staysail Ketch. Their victories will be celebrated tonight along with dozens more at the glamorous Trophy Presentation and Party on the lawn of Nelson’s Dockyard in front of the Copper and Lumber Store. Before it starts, an amazing slideshow of top photographic shots on the big screen will give the audience a chance to relive the week. The sailing is over but not the need to party with friends old and new. Live music from The Strays will kick off a night that everyone hopes will never end. The Gig Racing and Cream Teas take place tomorrow afternoon at the Admiral’s Inn. It’s a do-not-miss event with sailing, sinking and plenty of humour.